The majority of people have no understanding of the things with which they daily meet, nor, when instructed, do they have any right knowledge of them, although to themselves they seem to have. Dogs, also, bark at what they do not know. Heraclitus of Ephesus (Ἡράκλειτος, Herakleitos; c. 535 BC – 475 BC) was a Greek philosopher, known for his doctrine of change being central to the universe, and for establishing the term Logos (λόγος) in Western philosophy as meaning both the source and fundamental order of the Cosmos. Man, like a light in the night, is kindled and put out. All entities move and nothing remains still. Everything changes and nothing stands still. Everything flows and nothing stays. Everything flows and nothing abides. Everything gives way and nothing stays fixed. All is flux, nothing is stationary. All is flux, nothing stays still. This statement occurs in Simplicius' Commentary on Aristotle's Physics, 1313.11; while some sources attribute to Simplicius the coining of the specific phrase "πάντα ῥεῖ (panta rhei)", meaning "everything flows/is in a state of flux", to characterize the concept in the philosophy of Heraclitus, the essential phrasing "everything changes" and variations on it, in contexts where Heraclitus's thought is being alluded to, was current in both Plato and Aristotle's writings. You could not step twice into the same river. τὴν μεταβολὴν ὁδὸν ἄνω κάτω, τόν τε κόσμον γίνεσθαι κατ' αὐτήν. Change he called a pathway up and down, and this determines the birth of the world. αἰὼν παῖς ἐστι παίζων, πεττεύων· παιδὸς ἡ βασιληίη. Eternity is a child playing, playing checkers; the kingdom belongs to a child. History is a child building a sand-castle by the sea, and that child is the whole majesty of man’s power in the world. A lifetime is a child playing, playing checkers; the kingdom belongs to a child. Lifetime is a child at play, moving pieces in a game. Kingship belongs to the child. It is harder to fight against pleasure than against anger. Men that love wisdom must be acquainted with very many things indeed. Πόλεμος πάντων μὲν πατήρ ἐστι πάντων δὲ βασιλεύς, καὶ τοὺς μὲν θεοὺς ἔδειξε τοὺς δὲ ἀνθρώπους, τοὺς μὲν δούλους ἐποίησε τοὺς δὲ ἐλευθέρους. War is the father and king of all: some he has made gods, and some men; some slaves and some free. Hippolytus, Ref. haer. ix. 9 (Fragment 53). Context: "And that the father of all created things is created and uncreated, the made and the maker, we hear him (Heraclitus) saying, 'War is the father and king of all,' etc." Plutarch, de Iside 48, p. 370. Context, see frag. 43. Proclus in Tim. 54 A (comp. 24 B). 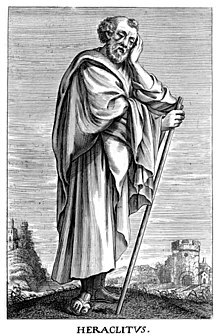 Compare Chrysippus from Philodem. P. eusebeias, vii. p. 81, Gomperz. Lucianus, Quomodo hist. conscrib. 2; Idem, Icaromen 8. Τίς γὰρ αὐτῶν νόος ἢ φρήν; [δήμων] ἀοιδοῖσι ἕπονται καὶ διδασκάλῳ χρέωνται ὁμίλῳ, οὐκ εἰδότες ὅτι πολλοὶ κακοὶ ὀλίγοι δὲ ἀγαθοί. αἱρεῦνται γὰρ ἓν ἀντία πάντων οἱ ἄριστοι, κλέος ἀέναον θνητῶν, οἱ δὲ πολλοὶ κεκόρηνται ὅκωσπερ κτήνεα. Clement of Alex. Strom. v. 9, p. 682. Proclus in Alcib. p. 255 Creuzer, = 525 ed. Cous. ii. Clement of Alex. Strom. iv. 7, p. 586." Ten thousand do not turn the scale against a single man of worth. Alternative translation: Big results require big ambitions. The many are mean; only the few are noble. Different sources sometimes number many of these fragments of the expressions of Heraclitus differently. Even sleepers are workers and collaborators on what goes on in the universe. Though wisdom is common, yet the many live as if they had a wisdom of their own. Variant translation: So we must follow the common, yet the many live as if they had a wisdom of their own. οὐ γὰρ φρονέουσι τοιαῦτα [οἱ] πολλοί, ὁκόσοι ἐγκυρεῦσιν, οὐδὲ μαθόντες γινώσκουσιν, ἑωυτοῖσι δὲ δοκέουσι. συνάψιες ὅλα καὶ οὐχ ὅλα, συμφερόμενον διαφερόμενον, συνᾷδον διᾷδον, καὶ ἐκ πάντων ἓν καὶ ἐξ ἑνὸς πάντα. Variant translation: From out of all the many particulars comes oneness, and out of oneness come all the many particulars. ποταμοῖσι τοῖσιν αὐτοῖσιν ἐμϐαίνουσιν, ἕτερα καὶ ἕτερα ὕδατα ἐπιρρεῖ. Ever-newer waters flow on those who step into the same rivers. He who does not expect will not find out the unexpected, for it is trackless and unexplored. He who does not expect the unexpected will not find it out. He who does not expect the unexpected will not find it, since it is trackless and unexplored. Unless you expect the unexpected, you will not find it, for it is hidden and thickly tangled. This universe, which is the same for all, has not been made by any god or man, but it always has been, is, and will be an ever-living fire, kindling itself by regular measures and going out by regular measures. The world, an entity out of everything, was created by neither gods nor men, but was, is and will be eternally living fire, regularly becoming ignited and regularly becoming extinguished. This world . . . ever was, and is, and shall be, ever-living Fire, in measures being kindled and in measure going out. The wise is one only. It is unwilling and willing to be called by the name of Zeus. The people must fight for its law as for its walls. It is wise to listen, not to me but to the Word, and to confess that all things are one. Listening not to me but to reason, it is wise to agree that all is one. Listening not to me but to the Word it is wise to agree that all things are one. He who hears not me but the logos will say: All is one. It is wise to hearken, not to me, but to my Word, and to confess that all things are one. The word translated in these quotes and many others as "The Word" or "Reason", is the greek word λόγος (Logos). The road up and the road down is one and the same. The road up and the road down are one and the same. The road uphill and the road downhill are one and the same. The way up and the way down are one and the same. And it is the same thing in us that is quick and dead, awake and asleep, young and old. The waking have one world in common; sleepers have each a private world of his own. You cannot step twice into the same rivers. Although the Law of Reason is common, the majority of people live as though they had an understanding of their own. Fragment 92, as translated by G.W.T. Patrick, trans. Men are at variance with the one thing with which they are in the most unbroken communion, the reason that administers the whole universe. Corpses are more fit to be cast out than dung. κύνες γὰρ καὶ βαΰζουσινὃν, ἂν μὴ γινώσκωσι. It is better to conceal ignorance than to expose it. Variant translation: Hide our ignorance as we will, an evening of wine soon reveals it. It would not be better if things happened to people just as they wish. Variant translation: It would not be better if things happened to men just as they wish. Τίς γὰρ αὐτῶν νόος ἢ φρήν; δήμων ἀοιδοῖσι ἕπονται καὶ διδασκάλῳ χρέωνται ὁμίλῳ, οὐκ εἰδότες ὅτι πολλοὶ κακοὶ ὀλίγοι δὲ ἀγαθοί. αἱρεῦνται γὰρ ἓν ἀντία πάντων οἱ ἄριστοι, κλέος ἀέναον θνητῶν, οἱ δὲ πολλοὶ κεκόρηνται ὅκωσπερ κτήνεα. For what sense or understanding have they? They follow minstrels and take the multitude for a teacher, not knowing that many are bad and few good. For the best men choose one thing above all—immortal glory among mortals; but the masses stuff themselves like cattle. All human laws are nourished by one divine law. Man's character is his fate. A man's character is his fate. A man's character is his guardian divinity. One's bearing shapes one's fate. Nature is wont to hide herself. Of Every One-Hundred Men, Ten shouldn't even be there, Eighty are nothing but targets, Nine are real fighters... We are lucky to have them... They make the battle. Ah but the One, One of them is a Warrior... and He will bring the others back. Attributed to "Hericletus c. 500 B.C." [sic] in The Tactical Rifle (1999) by Gabriel Suarez; no earlier source has been found. [With Heraclitus] we see land; there is no proposition of Heraclitus which I have not adopted in my Logic. I walked on to the next corner, sat on a bench at a bus stop, and read in my new book about Heraclitus. All things flow like a river, he said; nothing abides. Parmenides, on the other hand, believed that nothing ever changed, it only seemed so. Both views appealed to me. Ross Macdonald, The Chill (1963), Vintage Crime/Black Lizard edition, pp. 209-210. Max Müller, Natural Religion (1892) p. 253. Max Müller, Introduction to the Science of Religion (1873) p. 343. "You cannot look twice at the same river; for fresh waters are ever flowing in." "We look and do not look at the same rivers; we are, and we are not." What is the intended meaning of these sentences? I do not venture to find out. Yet I think that the originator of these senteces came pretty close to formulating the concept "steady flow of a fluid." When... Heraclitus names the world an ever-living fire that... extinguishes itself and again kindles itself, when... all is exchanged for fire and fire for all... he can only understand by this that fire, this restless, all-consuming, all-transmuting, and equally (in heat) all-vivifying element, represents the constant force of this eternal alteration and transformation, the notion of life, in the most vivid and energetic manner. ...the means of which the power of motion that is precedent to all matter avails itself for the production of the living process of things. Heraclitus... explains the multiplicity of things... [fire] condenses itself into material elements, first air, then water, then earth. ...These two processes of extinction and ignition... alternate... in perpetual rotation with each other and... in stated periods the world resolves itself into the primal fire, in order to re-create itself out of it again. ...[F]ire is to him... the principle of movement, of physical as of spiritual vitality; the soul itself is a fiery vapour; its power and perfection depend on its being pure from all grosser and duller elements. Albert Schwegler, Handbook of the History of Philosophy (1868) pp. 21-22. The part I understand is excellent, and so too is, I dare say, the part I do not understand; but it needs a Delian diver to get to the bottom of it. Socrates, when asked his opinion of Heraclitus's treatise, as quoted in Diogenes Laërtius's Lives of Eminent Philosophers (ed. R. D. Hicks), Book II, Ch. 5, sec. 22. Stephen Toulmin, Human Understanding (1972) Vol. 1 The Collective Use and Evolution of Concepts. This page was last edited on 5 April 2019, at 15:58.